^ a b c Bamber, GJ, Gittell, JH, Kochan, TA & von Nordenflytch, A 2009, Up in the air: How airlines can improve performance by engaging their employees, Cornell University Press, New York. ^ Lunsford, J. Lynn. “Airlines Dip Into Hot Water to Save Jet Fuel.” Wall Street Journal. 11 June 2008: B1. 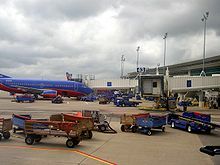 ^ “A Timeline of Southwest Airlines at a Glance”. seattletimes.com. Associated Press (The Seattle Times Company). (2009年6月25日). オリジナルの2011年1月12日時点によるアーカイブ。. http://www.webcitation.org/5vhAqwABL 2011年1月12日閲覧. "Acquires Morris Air to expand into the Pacific Northwest." ^ Peterson, Barbara S. (2004). Blue Streak: Inside jetBlue, the Upstart that Rocked an Industry. Portfolio Hardcover. ISBN 1-59184-058-9. ^ "Southwest Airlines Corporate Headquarters, Love Field, Dallas." Southwest Airlines. Retrieved on February 18, 2010. ^ World Airline Directory. Flight International. March 20, 1975. "503. 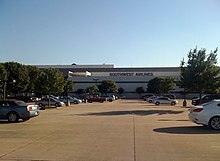 ^ a b "Southwest Airlines to expand headquarters and training facilities near Love Field." Business Wire. March 13, 1996. Retrieved on March 4, 2010. ^ "Southwest will report slim profit." The Dallas Morning News. April 26, 1990. Retrieved on March 4, 2010. "Mr. Kelleher, who made his remarks at the opening of the airline's new $15 million headquarters facility at Dallas Love Field,"
^ Lee, Christopher and Terry Maxon. "Southwest to announce expansion at Love Field $72 million project would add jobs, but no more flights." The Dallas Morning News. March 13, 1996. Retrieved on February 18, 2010. ^ "Southwest Airlines expands its corporate headquarters to prepare for the next century;." Business Wire. December 11, 1996. Retrieved on February 18, 2010. ^ Maxon, Terry. "Council OKs Southwest land lease Headquarters addition, training center planned." The Dallas Morning News. March 14, 1996. Retrieved on February 18, 2010. ^ Railway Age (Simmons-Boardman Publishing Corporation). (Dec, 1992).